Eurostar has created a rainbow carpet at St Pancras International to welcome revellers to Pride in London this weekend – and Transport for London has painted trans flags on tube benches. 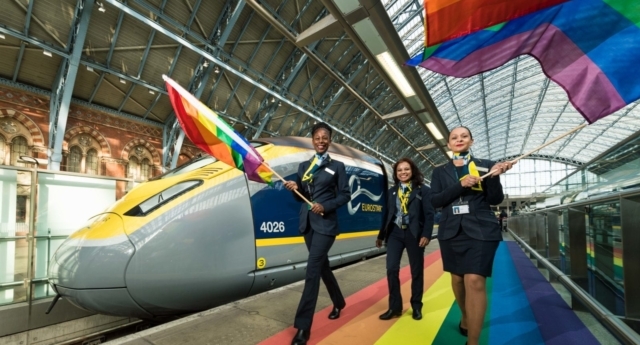 The Eurostar platform at the central London station has been freshly painted in the colours of the rainbow flag to celebrate the capital’s Pride parade on Saturday, July 7. Pride in London runs throughout June and into the beginning of July – with events, including a film festival, being held across the capital – culminating in the iconic parade this weekend, which tens of thousands are expected to attend. Meanwhile, Transport for London (TfL) has painted underground roundels and benches with the Pride-colours. TfL has also installed the trans flag – the first time it has done so – on some tube benches and roundels. Some queer football fans have been frustrated by the Pride in London march, which will clash with England’s match against Sweden in the quarter finals of the World Cup on Saturday. Pride in London has also been marred in controversy, with leading LGBT rights charity Stonewall pulling out in February, accusing the organisers of failing to represent people of colour. Earlier this week, European pride organisers hit-out at Stonewall in a damning new report, condemning the charity for partnering clothing brand Primark. The new report – compiled by the UK Pride Organisers Network and European Pride Organisers Association – slammed the LGBT+ rights charity’s recent conduct, and demanded an apology from chief executive Ruth Hunt. The publication contained six recommendations for the charity.